Simply add your favorite essential oils, shake well and spritz away. Spritz your body after showers/baths. This should be spritz on very lightly, then smoothed on with a few strokes. The moisturising ingredient can act like a lotion and can turn cloudy if rubbed on too vigorously. This Unscented Body Spray makes it easy for you to make your very own personalized body scent. Some may even call it their "perfume". The manufacturer recommends adding up to 1% essential oil per ounce of body spray when you do not use additional polysorbate 20. For scenting most body sprays - you want to use up to 2% to 3% essential oils depending on the essential oils used. In other words for every 1 fluid ounce of Body spray you can use 12 to 18 drops of essential oils. So if you are making 4 ounces of scented body spray you can use 48 - 72 drops total of essential oils. You will need to mix the essential oils with Polysorbate 20 emulsifier then add to the body spray. You will need about 5ml (100 drops) of Polysorbate 20 for 72 drops of essential oils. Don't forget to buy a few little misting vials to take along your new spray filled with your favorite Body Sprays and Perfumes that you made with your very own Essential oils! Adding essential oils to the Body Spray may make the finished product appear cloudy. This cloudy reaction is normal with some essential oils. Be sure to add emulsifier to your essential oils before adding them to the Body Spray. If you do not add the essential oils to some emulsifier your essential oils will just float on top and not mix in with the body spray. 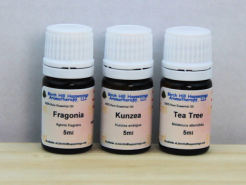 Emulsifier should be mixed with the essential oils 1:1 (for every drop of essential oils use a drop of emulsifier). Remember some ingredients will cause an inherent odor which may alter the smell of your finished product. The inherent smell is very minimal in this product. To add essential oils to the Body Spray the guidelines recommend adding no more than 12 -18 drops per ounce of product. The manufacturer recommends adding less than 1% essential oil per ounce of Body Spray when you do not use any emulsifier. Otherwise you must use an emulsifier to help the essential oils blend correctly. You still need to Shake well before each use. Do not use any cold pressed citrus oils in this product if you will be using it on your skin that will be exposed to sun or UV lights within a few hours of use as Photo Sensitive/Toxic reactions could occur.